New Delhi: The original bad boy of bollywood Sanjay Dutt will be speaking at the India Today Mind Rocks Youth Summit at Sirifort Auditorium, New Delhi on Saturday, 16th September. The star best remembered for his role in blockbuster films like Rocky, Vaastav, Khalnayak and Munnabhai MBBS will be baring his soul in the session – Living life on the edge. He is expected to speak on his tumultuous personal and professional life while interacting with the youth and motivating them to find the right direction in their lives. The daylong event will have other young leaders, achievers and newsmakers engaging with the youth. The other stars at the event include Varun Dhawan, Ayushmann Khurrana, Kriti Sanon, Tanuj Virwani, Vivek Oberoi and Terence Lewis. Smriti Z. Irani (Union Cabinet Minister of Textiles and Information & Broadcasting) will open this year’s edition with her straight talk to the youth on lessons of being a minister. 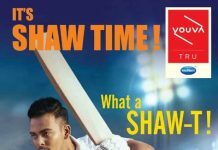 The youth icons from the other spheres include the women’s cricket team members Veda Krishnamurthy, Harmanpreet Kaur and Smriti Mandhana, stand up comedian Kunal Kamra, young entrepreneurs and corporate leaders Taru Kapoor, Tinder, Sachin Bhatia, founder Truly Madly and Kavin Bharti Mittal, CEO, Hike, Leaders from Politics Manoj Tiwari, MP, BJP, Gaurav Gogoi, MP, Congress, Kalikesh Singh Deo, MP, BJP and Satpal Maharaj, Minister, Uttarakhand. The evening will be closed on a high note with a music concert by EUPHORIA. 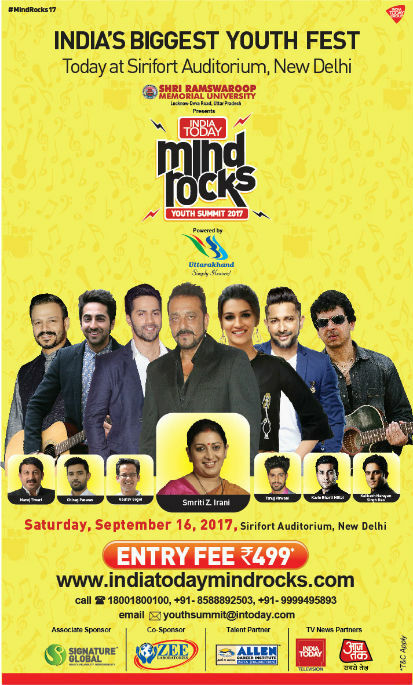 India Today Mind Rocks is an annual date to remember. The aim of this daylong event is to give young people the unique opportunity to interact with their favourite stars – the real achievers who have struggled, overcome and today are acknowledged leaders in their fields. Come, listen to them and be inspired by them as they recount their unique experiences and give you their Mantras of Success.